Join us for an exclusive screening of the critically acclaimed short documentary Arc of Justice, directed by Helen S. Cohen and Mark Lipman, which traces the journey of New Communities, Inc., in southwest Georgia, a pioneer of the community land trust model. Stay for a discussion about how CLTs are being formed in New York City. 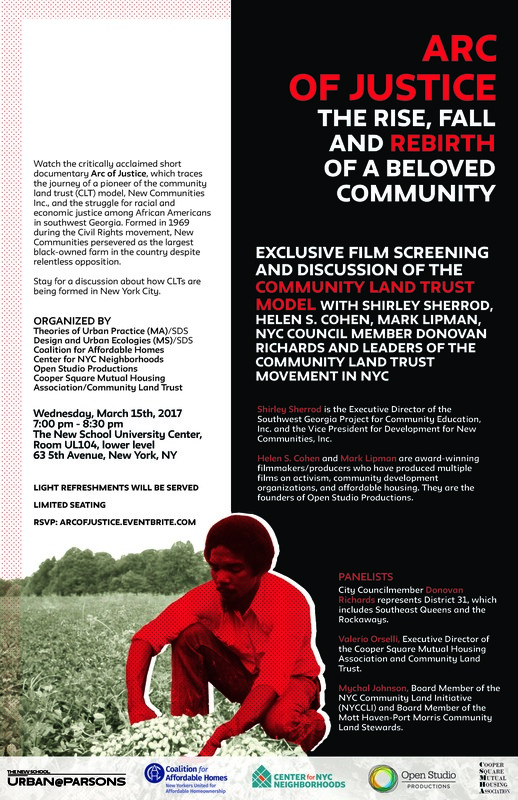 Shirley Sherrod, the co-founder of New Communities, Inc., and the filmmakers Helen S. Cohen and Mark Lipman will deliver remarks. The panel discussion will feature City Councilmember Donovan Richards; Valerio Orselli, Executive Director of the Cooper Square Mutual Housing Association and Community Land Trust; and Mychal Johnson, board member of the NYC Community Land Initiative (NYCCLI) and board member of the Mott Haven-Port Morris Community Land Stewards. Screening sponsored by the Center for NYC Neighborhoods, Urban at Parsons School of Design, the Coalition for Affordable Homes, Hub.UP Parsons Urban Students Group and the Cooper Square Mutual Housing Association. Light refreshments will be served at 6:30, Event will begin at 7pm. Admission is free. Seating is limited. EVENT IS SOLD OUT. The documentary traces the inspiring journey of New Communities Inc., and the struggle for racial and economic justice among African Americans in southwest Georgia. Formed in 1969 during the Civil Rights movement, New Communities persevered as the largest black-owned farm in the country, even despite relentless opposition. New Communities lost its land in 1985 due to discriminatory lending practices by the U.S. Department of Agriculture, but then prevailed in an historic lawsuit, staking its claim to new land and a new beginning in 2009. Watch the trailer of Arc of Justice here. Newer Post Join us for the Startup Design Jam! on April 1st, 2017! Older Post ELab User Testing Workshop – Saturday, March 18!